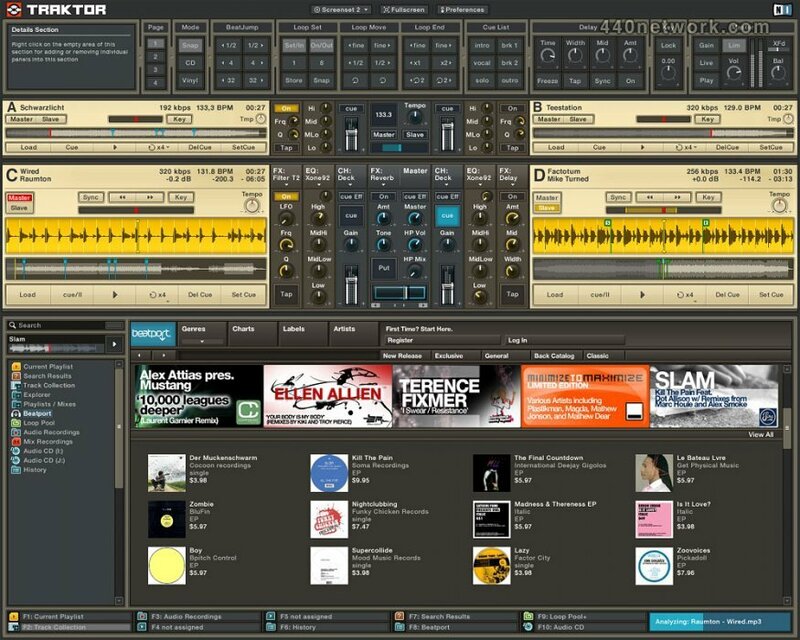 Traktor DJ Studio is an allowing software solution for professional DJ, mixing, mix recording and live remixing, using tracks in MP3, WAV, AIFF, and Audio CD format. TRAKTOR DJ Studio exceeds the possibilities of traditional DJ equipment by implementing a vast range of mixing features that only software can provide. This includes graphic waveform displays, tempo recognition and automatic synchronization, up to 10 cue points and 10 tempo-precise loops per track, and a track database with ultra fast search function. TRAKTOR DJ Studio was developed in cooperation with professional DJs and opens up a whole new world of real-time mixing and remixing possibilities. Various Drag & Drop improvements including "Transparent Deck Duplicate"
Universal Binary arrives! TRAKTOR 3.2 is now fully compatible with Intel Macs. Create synchronized copies of tracks instantly. Remix songs in real -time by adding effects and loops. This feature opens up cool new possibilities to explore your skills in manipulating tracks. Whilst a track is playing on one deck, it's now possible to duplicate it and place it on another deck, in the exact same position and in sync with the original. From here anything is possible- create loops, add effects or get busy on the faders - push your skills to the limits as you remix a track completely on -the -fly. Beatport 3 now available as TRAKTOR Beatport Store. Featuring DJ, genre and other charts, plus artist and label landing pages reachable from within TRAKTOR 3. Also added is a powerful search function allowing you to find tracks in the TRAKTOR Beatport Store starting from fields in your local track library. Autoplay now available for TRAKTOR 3 users who prefer to hook up an external mixer. Tempo detection now considerably improved as well as the addition of a pre-selectable tempo range. Improved deck caching allows you to remix tracks live in ways not available in previous versions. Tracks can be loaded directly into memory for improved looping and cueing. * New: The "Renumber" button has been replaced by a "Lock" function in the context menu of each playlist. Locked playlists do not recall changes made to them during a Traktor session. Permanent changes to playlists have to be applied in unlocked mode. Sorting by the numbered column (#) restores the original sequence of the playlist. All old playlists are initially locked by default. New: Instant streaming of Beatport Preview clips. New: Details panels are color coded according to the related deck color. New: Details panels can be assigned permanently to a single deck. New: "Growing Separators" allow to arrange Details panels right adjusted. New: (FS) Single turntable mode for up to 4 decks with seamless transition into internal playback mode *and* back to timecode mode. New: Scroll-wheel support, "ghost-pointer" and incremental sensitivities for faders and the cross-fader. New: Show Full collection sorted by Artist, Genre,... when clicking on the relative Collection subfolder. New: "No Effect" for reducing overall CPU load on slow computers. Fixed: The import process from Traktor DJ Studio 2.x collections did not automatically import the Stripes folder. Fixed: The Beatport Online Store did not work on Mac OS X 10.4.3. Fixed: Master output meters did not work in External Mixer mode. Fixed: Hotkey control got lost in certain situations. Fixed: crash when attempting to open history files. Fixed: impossible numeric entry into the master clock tempo. Fixed: crash when exporting playlists for printing. Fixed: pitch skips when switching decks in single timecode mode. Fixed: auto-repeat on incremental tempo changes. Fixed: "Hold" is now default when assigning a hotkey to a triggered function (in version 3.0.0. "Toggle" was default). Fixed: Native Mix recording did not preserve Key-Lock settings when recording pitch-bends. Fixed: Native Mix Recording did not correctly record tempo synched master effects. ...and more bug fixes and performance optimizations. Five innovative, tempo-synched DJ-effects created by leading sound designers: Delay, Reverb, Flanger, Beatmasher and LFO-assignable filters. The new version of TRAKTOR DJ Studio is now fully compatible with Stanton's new FinalScratch 2 hardware, offering DJs mixing with this setup a whole new realm of possibilities. DRM-free WMA and AAC file formats are now supported. By using Icecast servers (an open source version of the Shoutcast protocol), the mix can be streamed live over the internet. A pre-requisite is, however, that the relevant servers are available and that the protocol is supported by the ISP. Connect a microphone or line signal directly to TRAKTOR DJ Studio 2.6 and record the signal on-the-fly. The resulting audio file can then be loaded into the virtual deck and mixed back into the set. Alternatively, you can "stream" the live signal directly to your mix - making it possible to add your moderation or a live act to your DJ mix and internet braodcasting. As well as the popular mix automation feature, it is now possible to record your live mix directly to the hard drive in WAV or AIFF formats. A "History" function is now incorporated into the playlist feature, which automatically records details about the date and time tracks were played. Create exact playlists of your mix-sets quickly and easily – print them out or export them. As well as this the browser has special 'bookmarks' for fast access to 12 of your favourite folders. 1-minute markers are included in the small waveform window which displays the entire track. These helpful guides also correspond to the markers on the time-code embedded records, when using TRAKTOR with the new Stanton FINALSCRATCH 2 System. Traktor DJ Studio 2.5 features a redesigned time stretching engine allowing pitch-independent tempo changes of up to +/- 30%, or tempo-independent pitch shifting of up to six semitones, without audible artifacts. Also in the upgrade: an enhanced visual interface with a full-length track overview for each deck, OSC integration for sync across networks, 100% Final Scratch compatibility, seamless looping, user-defined screen setups, complete support for iTunes song fields, hot swap of external devices, and volume/tempo recognition on import. The real party 4 digital djs! Domage que dj console ne marche pas avec!